Princess Benedicte is a stunning custom built fiberglass Speedboat that is designed for traveling at high speed in complete comfort. The boat has a gorgeous front sun-deck which enables sun lovers to lie down and sunbathe at any time during the charter. It also has comfortable shaded seating for 6 and an elevated VIP double seated chair at the stern. The extensive features of the boat which are listed below make Princess Benedicte one of the most versatile boats in our entire fleet. The 250 HP Suzuki 4-Stroke engine is not only perfect for the calm shallow waters of the Pattaya archipelago it is also so quiet you will have trouble even hearing it. 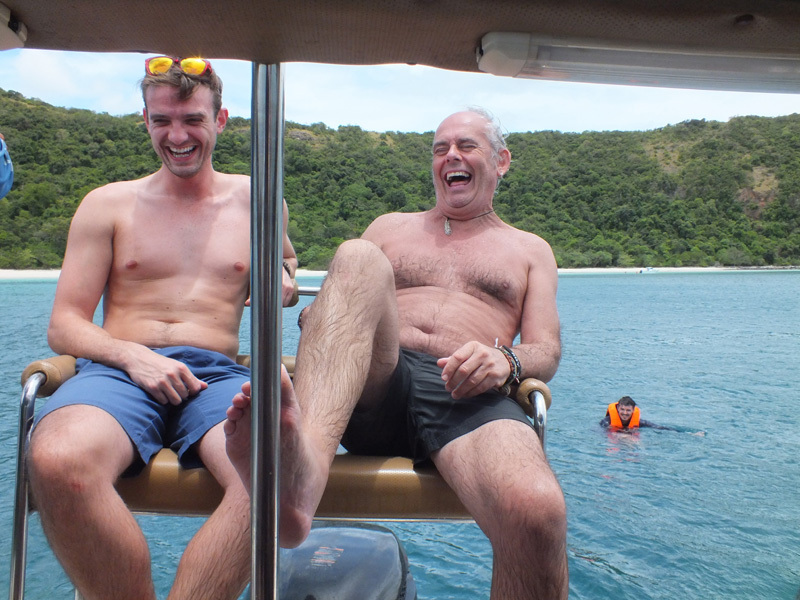 Relax and enjoy one of Pattaya Yacht Charters favourite vessels. Princess Benedicte offers two types of trip. Full Day Private Charter. Enjoy lunch at a delicious Thai and seafood restaurant. Feed the Monkeys at Monkey Island! Enjoy a full day speedboat charter to various deserted white sandy beaches and deserted Islands. We guarantee that we will take you to the best spots with the best beaches and clearest waters whilst avoiding the crowds. We will also feed the cheeky monkeys at Monkey Island. The native monkeys are always happy to meet any guests that arrive upon its rocky shores. A delicious lunch will be served at the idyllic Sai Kaew Navy beach. There will be plentiful freshly cooked delicious Thai and seafood dishes to enjoy. Enjoy snorkeling in various calm coral reefs and even Sea Kayaking is available for the adventurous. deserted bays as we do one complete lap of the stunning island. B) Water-sports – We find a bay where the water is at its calmest. Try water-ski, wakeboard or a banana boat ride. C) Fun Fishing – Cruise to where our experienced captain thinks the fish will be biting and hopefully land some fish. 1pm-3.30 pm. Head to Sai Kaew Navy Beach where you can enjoy a range of Thai and Seafood dishes at the delightful restaurant. Relax, swim, bathe, eat and drink! At Sai Kaew Navy Beach you can also try sea kayaking if you would like? 3.30pm-4.15pm. Cruise to Monkey Island and feed these amazing monkeys. You can even swim with the friendly monkeys. Don't forget your camera! Head back to mainland around 5pm and transfer back to hotel around 5.30pm. A wide variety of freshly cooked delicious Thai and seafood dishes. Snacks – Watermelon, Crisps & Chocolate cup-cakes. Mineral Water, Coke, Fanta Orange and Sprite, Singha & Leo Beer. Far Island trip to Koh Phai, Koh Man Wichai and Koh Rin. BBQ on quiet white sandy beach with crystal clear water. The Far islands have some of the most beautiful white sandy beaches and the best crystal clear water in the entire Pattaya archipelago. Each island is totally unique and has a different feel to it yet all share the same theme of absolute serenity. The Far Islands our becoming increasingly popular with tourists but you can rest assured that the plentiful experience and expertise of our captains will keep you away from the crowds. Hotel pick up at 9.30am. A) Snorkeling and swimming in the clear waters and stunning coral reefs. There are plenty of great spots for snorkelling around the large deserted Island. Explore some deserted bays and beaches as we do one complete lap of the stunning island. C) Fun Fishing – Cruise to where our experienced captain thinks the fish will be biting and hopefully land some fish for the BBQ. 1pm-3.30 pm. 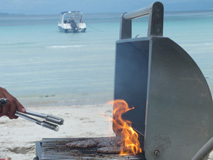 Head to Koh Man Wichai Beach where you can enjoy a delicious beach BBQ! Relax, swim, snorkel, eat and drink in the secluded bay! 3.30pm-4.15pm. Cruise to Koh Rin Island Island and enjoy the absolutely stunning beach and picturesque bay. If you love snorkeling there are two stunning coral reefs at Koh Rin North rock and its South rock. BBQ - Hickory smoked ribs, chicken wings, pork & chicken skewered kebabs, beef burgers, potato salad and Tiger prawns! Mineral Water, Coke, Fanta Orange, Sprite, Singha and Leo beer. Add a top of the range Jet ski to accompany any trip with unlimited fuel for just 9,500 THB!